The evolution of the film structure of polyimide PM-A (Kapton H type) after deformation at T = 300K, the effect of low temperatures and subsequent deformation at liquid nitrogen and liquid helium temperatures is studied. Particular attention is paid to comparative analysis of structural changes in the process of various external influences. The starting material was a film synthesized from solutions of prepolymers with a thickness of 0.08 mm. Part of the samples were subjected to a successively of temperature deformation and uniaxial deformation. For the original samples, we observed a symmetrical halo on the x-ray diffraction pattern on the small angles. The cooling of the polyimide film at T = 77 K 4.2K leads to the appearance of an additional peak in the region of smaller angles. The deformation of the sample at room temperature leads to the appearance of an additional peak in the region of large angles. Low-temperature deformation at temperatures of liquid nitrogen and liquid helium affects the structural state of the samples in different ways. Proposed two "mechanism", which are qualitatively, describe the processes in this polyimide films after deformation at low temperatures. It is assumed that as a result of cooling, "bundles" are formed, consisting of a different number of polymer segments. Low-temperature deformation at 77K and 4.2K, respectively, leads to compression and rupture of these bundles. Manzhelii V.G., Freiman Yu.A. Physics of Cryocrystals. – Woodbury, New York: AIP Press, 1996. 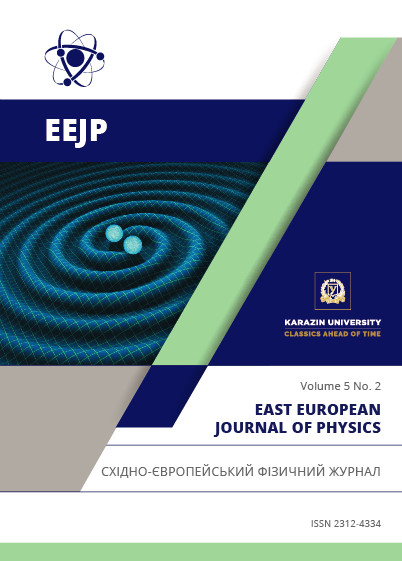 Lototskaya V.A., Yakovenko L.F., Aleksenko E.N., Abraimov V.V., Wen Zhu Shao Low temperature deformation and strength of polyimide films due to thickness and deformation speed // East. Eur. J. Phys. – 2017. – Vol.4. – No.2. – P.44–52.